A small pulse (legume) that is most commonly grown as a crop in India. It is used as a food for both human and animal consumption. Small, thin and oval-shaped, this bean may be light to dark colored in shades of red, brown and black. When cooked it provides a slightly strong, somewhat earthy flavor. It is eaten as a whole bean, as a sprout, or as whole meal when prepared as a side dish or as a main dish with other ingredients. 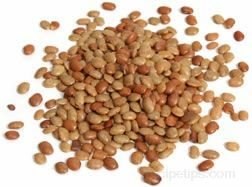 In some regions, the horse gram is boiled and then crushed with salt after which it is allowed to ferment in order to produce a sauce that is used in the same manner as soy sauce. 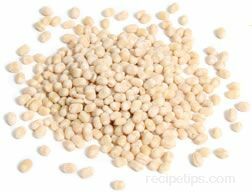 Somewhat similar to the moth bean which is considered the "poor man's food," horse grams also have the same connotation.